I did not see a "classified" section to post this. If it is not appropriate to post this here, I apologize. Please feel free to delete. I'm considering selling my Jackson Concorde Copy. The guitar was manufactured in China and has been heavily modified with all high quality hardware and electronics. The guitar has been given a good setup, plays and sounds awesome. Unfortunately, I just don't play it enough to really justify keeping it and would rather see it go to someone who would give it the playtime it deserves. $950 / Shipped within the Continental US only. I sent you an email about it! I have it advertised on another RR forum but as of now, the guitar is still available. I'm really surprised there are no takers. This guitar has been completely overhauled and is ready to go. Order one from "RareElectricGuitars" and you're going to have your work cut out for you. Trust me. Normally what happens after that is that you pay for the item. If you're serious, you may send payment Via PayPal to the email address above. Include your shipping address and contact information and I'll send you the tracking number. Alright. I sent you the $950 through PayPal. Looking forward to seeing the guitar! You're going to love this guitar. It's supposed to arrive on the 5th. The wait is killing me. It'll be worth the wait. 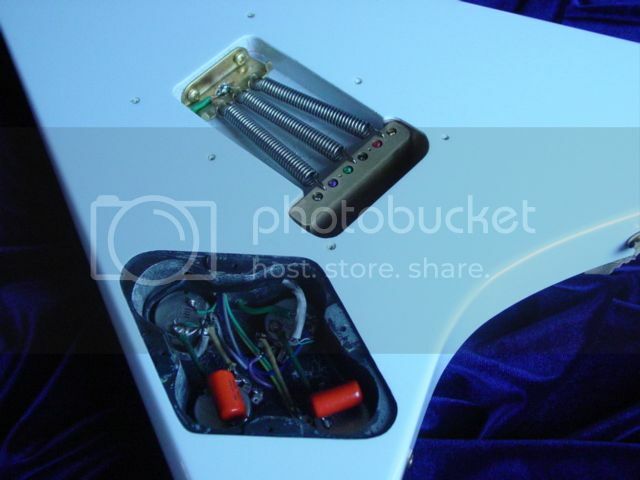 There's a spare whammy bar in the case compartment. Those original Charvel bars are hard to find, so when I found one listed on eBay, I grabbed it as a spare. I also put the straplocks in the same compartment. I'm really looking forward to you getting it! I'm loving the guitar! It sounds badass and plays wonderfully! nice to see when a transaction goes through successfully !